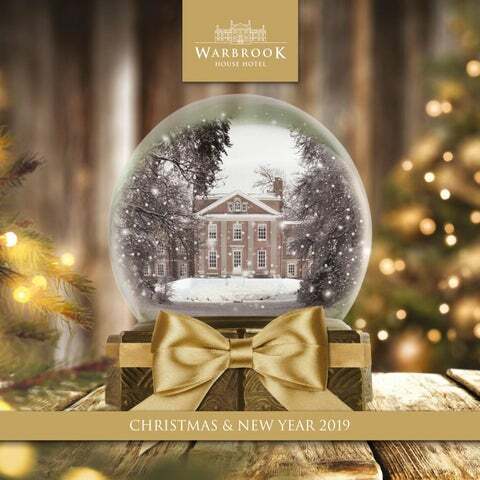 Join us for a Christmas to remember at Warbrook house hotel with fine wines, glittering entertainment and the highest standard of food and service. As you reach the end of the tree-lined driveway, Warbrook House Hotel sweeps into view: a magnificent Grade I listed Mansion set in 121 acres of Grade II listed gardens, complete with its very own Versailles style canal. Whether you are looking to hold a private lunch or evening party, or to join one of our fantastic shared party nights, perfect for smaller groups, we have something to suit everyone. Christmas Party Nights Enjoy a glass of prosecco on arrival followed by a delicious three course meal, festive novelties and dancing with our fantastic DJ who will be playing all the dance floor classics. Festive Lunches Our fantastic festive menu isnâ&#x20AC;&#x2122;t just for evening parties. Enjoy a glass of prosecco on arrival followed by a festive themed three course delicious lunch in our beautiful Brasserie restaurant. Christmas Day Lunch A family feast without the fuss Lets us take the hassle out of Christmas leaving time for you to relax with your family and friends. Enjoy a luxury four course festive lunch in our beautiful Brasserie Restaurant or Stapleton James Suite. Accommodation To complete your Christmas celebrations, take advantage of our special accommodation packages in one of our stylish bedrooms. Arrive any time after 3pm and relax in the bar and lounge areas. After the festive fun, enjoy a nightcap in the bar before returning to your room and look forward to a well-earned lie in, followed by a leisurely breakfast in our restaurant. Single Occupancy - ÂŁ60 per room Double Occupancy - ÂŁ70 per room Warbrook House Hotel offers 71 bedrooms which are located across the estate in The Mansion House and The Grange. Set in incredible surroundings, as you reach the end of the tree-lined driveway, Warbrook House Hotel sweeps into view: a magnificent Grade I listed mansion designed by renowned architect John James in 1724, set in 121 acres of Grade II listed gardens, complete with its very own Versailles-style canal.